However long you have in Seoul, you’ll find it to be a bustling, dynamic, vibrant metropolis with plenty to see and do; it’s also bloody freezing in winter! This latter point makes some of the non-ski resort activities less attractive than they might normally be, though still doable if you’re prepared. If you visit Seoul in summer, you’ll see couples sitting with their feet in Cheonggyecheon stream and groups gathering for picnics in parks or on the banks of the Han River – the winter climate isn’t conducive to doing any of that though, so here’s the Snow Guide Korea guide to visiting Seoul in winter. First things first, Seoul is bitterly cold in winter, and bone dry; a typical day sees bright sunshine and a clear blue sky, with freezing temperatures and an icy wind often ripping across the city. The temperature remains subzero most of the time throughout January & February (you should usually expect minus 5 to minus 10 Celsius at night) and the rivers & lakes freeze solid, though it seldom snows. Buildings are very well heated and insulated, but be ready to wrap up whenever you head outdoors. The Han cuts across Seoul from east to west, with the city’s traditional heart on the north side of the river and the fashionable modern districts on the south, including the famous Gangnam of Psy fame. The small mountain Namsan, topped off by N Seoul Tower, stands pretty much dead centre of the city, just on the north side of the Han, and is the most obvious landmark for orientation. The enormous new Lotte Tower standing in Jamsil (in the southeast of the city) provides another useful landmark. You can also often get your bearings from the mountains, especially Bukhansan (on the northern edge) and Gwanaksan (on the southern edge). Most traditional sights (palaces, markets etc) are found to the north of Namsan, while there’s plenty of shopping and nightlife on both sides of the river. For the best resorts, head over to Gangwon-do province. The best downhill riding is at Yongpyong and High1; if you’re more interested in freestyle, Phoenix Park and Welli Hilli Park have the most impressive park & pipe setups. If you’re staying in Seoul and looking for something nearby for a day-trip, there are half a dozen resorts in the immediate vicinity of the city; the most convenient are Konjiam and Elysian Gangchon. For a good compromise between size of hill and convenience of access, Vivaldi Park is a good choice. Seoul’s main traditional sights are the five Grand Joseon Dynasty Palaces, and Jongmyo Confucian Shrine. See here for more on visiting them, including which ones to go for if you only want to pick out one or two. Bukchon Hanok Village: Hanok is the name for traditional Korean homes, with their attractive brick architecture and tiled roofs. 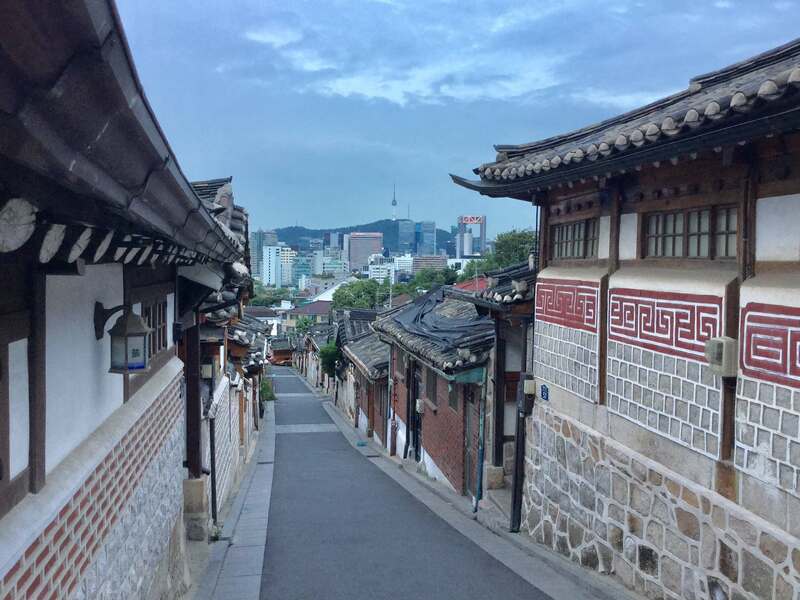 They’re a rare sight in Seoul where monolithic high rises mostly dominate the landscape, but the Bukchon Hanok Village is an area which has retained its old homes and traditional atmosphere, and ended up becoming a popular tourist sight as a result. It’s still very much a residential district, but many of the owners have opened cafés and restaurants aimed at the tourist trade. There are also various galleries, workshops, and homestays in the area. It’s a nice neighbourhood for an afternoon of strolling or warming up with a coffee, and it’s one of the most photogenic corners of the city (just remember people live there so don’t go poking your camera where it isn’t welcome). Bukchon Hanok Village is between Gyeongbokgung Palace and Changdeokgung palace, a 10-minute walk north up the hill from Anguk Station. If you want to get a bird’s eye view of Seoul – without hiking up a mountain in subzero temperatures – you can go up to one of these observation decks in Seoul’s skyscrapers and towers. Lotte World Tower: Seoul’s newest and tallest skyscraper, Lotte World Tower is the world’s 5th tallest building at 555m (with 123 floors), with the ‘Seoul Sky’ observation deck occupying the top 6 floors. Access is via Jamsil Station, and it costs 27000 won to go up to Seoul Sky. Lotte World stands next to Seokchon Lake and is part of the massive complex of Lotte developments occupying Jamsil, including Lotte World theme park and various department stores; you can easily fill a day in the area checking it all out (and it’s all connected up underground – ideal for those really cold days when you don’t want to be outside). N Seoul Tower: Seoul’s most famous landmark, this old TV tower stands on top of Namsan mountain in the middle of the city. 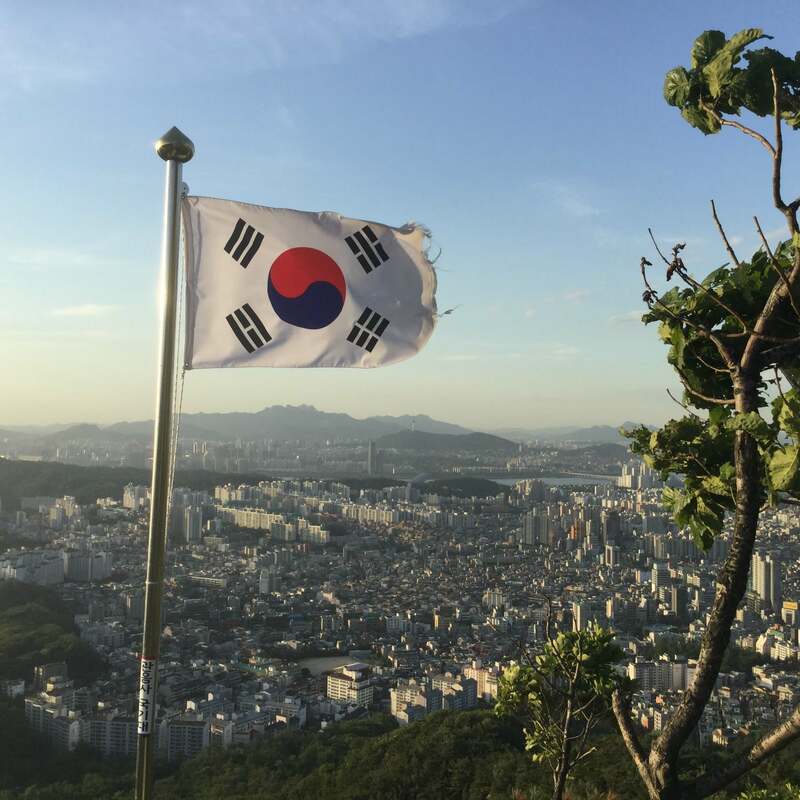 Although the tower is only 236m tall, Namsan itself is 243m tall so the observation deck is over 400m and commands excellent views of the entire city. Namsan makes a pleasant hike up from Seoul Station or Myeongdong even in winter (for details see here); you can also take the bus or cable car up from Myeongdong. It’s 10000 won to go up to the observation deck, but there are also good views for free (and plenty of restaurants & cafes) from the area around the base of the tower. 63 Building: These days thoroughly overshadowed by Lotte Tower, 63 Building used to be the city’s tallest and has an observation deck on the top floor (the 63rd – hence the name). 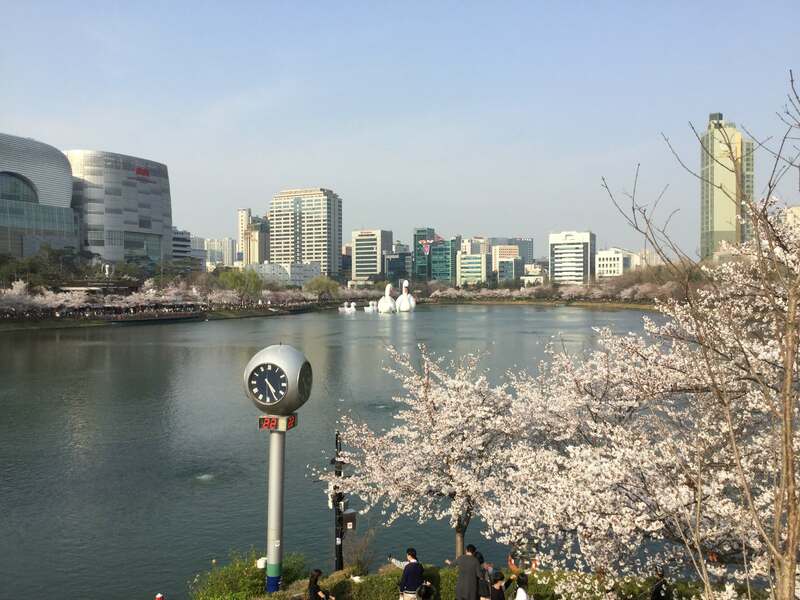 It’s located on the sizeable Yeouido island in the Han river and remains a good option if you’re on the west side of the city and don’t fancy the trek over to Jamsil or up Namsan. It’s a 10-minute walk from Yeouinaru Station and costs 13000 won to go up. National Folk Museum: this museum covers Korean traditional life from pre-medieval times through to the end of the Joseon period. 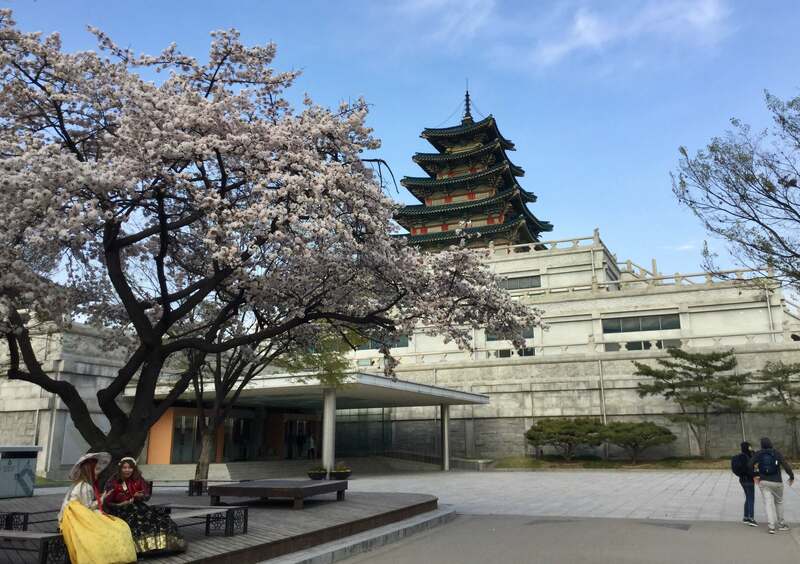 For most visitors it’s not going to be worth going out of your way for, but its location in a handsomely pagoda-topped building on the grounds of Gyeongbokgung makes it easy to check out as part of a visit to the palace. Seoul Museum of History: located on the grounds of Gyeonghuigung (the smallest and least visited of Seoul’s 5 palaces), this museum has a fairly eclectic mashup of exhibits covering local history, some art, and random rotating exhibitions (last time I was there they had one on the thorny issue of Japanese war crimes). There’s a cool scale model map of Seoul occupying a large room upstairs which you look down on from glass walkways. 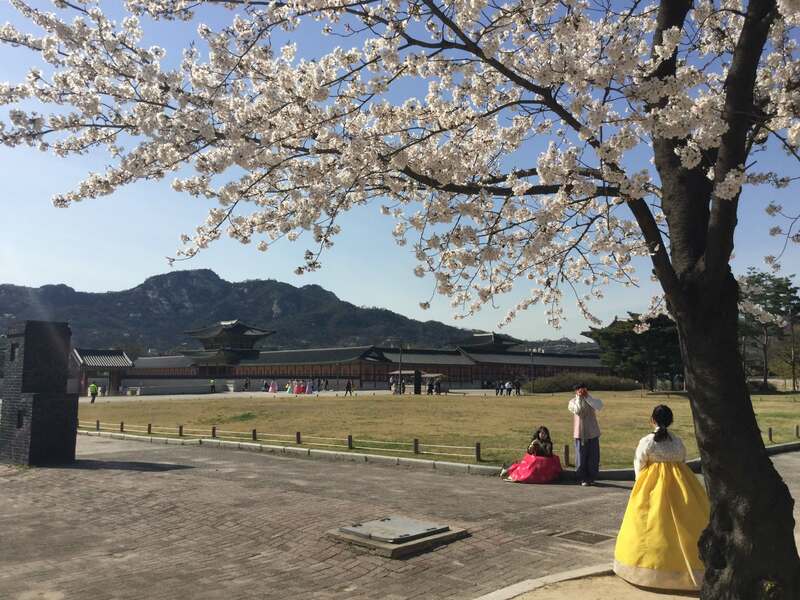 While probably not worth crossing the city for in its own right it makes a good activity in conjunction with the neighbouring palace, and you can also make the short walk to nearby Deoksugung Palace for a nice museum & palaces half-day out. 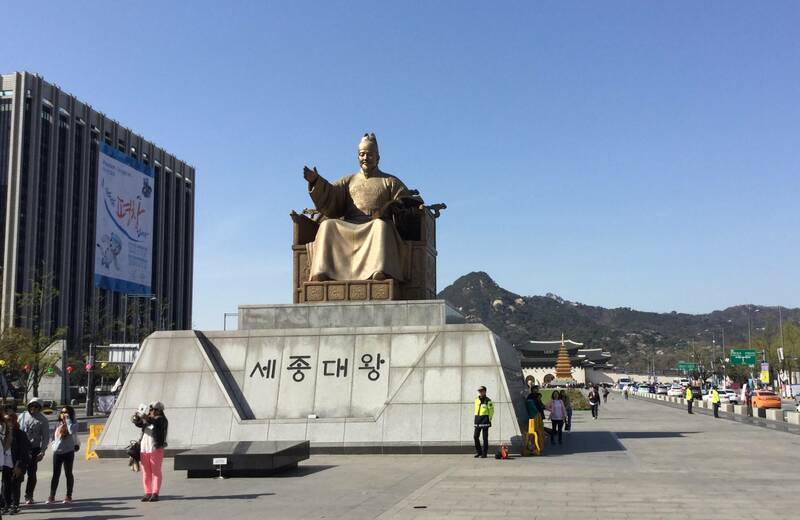 King Sejong Story: this museum’s cool to visit just for the Indiana Jones-esque entrance built into the base of the statue of King Sejong in the middle of the wide Sejong-daero boulevard (on the approach to Gyeongbokgung Palace in Gwanghwamun). Go round the back of the statue to find the entrance, and the museum’s downstairs. It’s free to visit and it’s quite a surprisingly large space down there, with the main exhibits on Admiral Sun Shin and the Japanese invasions in the 1500s (the other prominent statue on Gwanghwamun is of Admiral Sun Shin), and on the Hangeul script designed by King Sejong (staff are available to teach you how to write your name). It’s not a mind-blowing museum or anything, but it’s free and makes a cool way to pass an hour or two and worth stopping in if you’re nearby e.g. to visit Gyeongbokgung. Access via Gwanghwamun exit 9, or walk directly south when exiting Gyeongbokgung. National Museum of Korea: the National Museum of Korea is the one to go for if you’re after a large, serious, world-class art and history museum. It’s huge and you can easily spend half a day on your first visit without covering everything; if you only visit one museum in Seoul (and don’t have a specific interest in any particular one), it should probably be this one. War Memorial of Korea: both a memorial to the fallen Korean & allied soldiers of the Korean War, and a museum detailing the history of the Korean War plus some more general displays of military hardware, this is well worth a visit if you want to brush up on the history of the division of Korea and resulting conflict. Some of the displays inside the museum are a little jingoistic, but the memorial itself (individually listing the names of all the many thousands upon thousands of fallen) is a sombre & moving place. Seodaemun Prison: This former prison was used by the occupying Japanese government mostly to detain political activists, many of whom were subject to torture and execution without trial (there is an execution chamber within the prison). It leaves me in two minds to be honest – it’s an important place and a dark piece of history which should be acknowledged & remembered, however some of the torture exhibits (using models in graphic poses and blood-curdling soundtracks) I feel cheapen it as a memorial, while it also makes the glaring omission of how the prison was used following the end of Japanese rule (i.e. it fails to acknowledge that the nationalist dictatorship which then governed Korea for 40 years also used Seodaemun Prison the same way). Still, if you’re interested in this period of Korea’s history it’s worth a visit. Dongdaemun Design Plaza (DDP): DDP is a multi-purpose convention centre and architecturally stunning public space, which includes a design museum. The museum itself is fairly modest, but taken as part of the DDP it’s well worth visiting; the DDP is part of Dongdaemun History & Culture Park, and the area’s also good for fashion, eating, and general wandering. Namdaemun: the obvious choice for a traditional market in Seoul, Namdaemun is a sprawling market in the vicinity of the Sungnyemun gate for which it’s named (Namdaemun means ‘Great South Gate’). They sell pretty much anything you want at Namdaemun, from clothing to furniture and cameras to chess sets, with plenty of food & drink stalls in the mix; it’s also the most photogenic market in Seoul, so it ticks all the boxes. Noryangjin: this one’s for the seafood lovers – Noryangjin is Seoul’s main fish market. The main trade here is wholesale fish to restaurants around the city, but there are also a number of restaurants on site. If you like your seafood so fresh it’s still moving (literally, if you order it that way), head to Noryangjin. Dongdaemun Market: Dongdaemun literally means Great East Gate, and the area is named for Heunginjimun, the east gate of the old city walls. The area near Heunginjimun is the heart of Seoul’s fashion & design scenes, being home to the Dongdaemun Design Plaza and multiple malls and indoor fashion markets. The cluster of malls on the main road opposite DDP are fairly standard shopping malls, while the indoor markets behind DDP are full of independent designers spread over many floors, selling their wares wholesale to buyers from the city’s fashion stores. Although not intended as a place for the average retail shopper to buy individual items, you can still go inside these market buildings and wander around. If you see something you like the stall holder will usually be happy to sell you it, but note that these markets are aimed at bulk fashion store buyers and active through the night (as in all night long) – if you go before 8pm you’re too early. It’s not this author’s scene at all, but even I found it reasonably interesting to check out the time I got dragged in there! 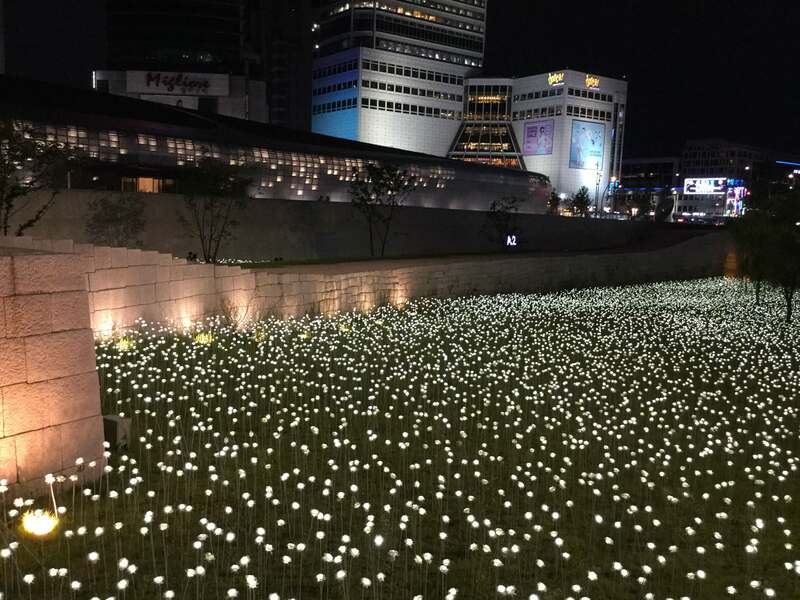 For non-shoppers, the Dongdaemun Design Plaza and Dongdaemun History & Culture Park are going to be of more interest (see museums, above), and the Dongdaemun area also has lots of retail stores, cafes, a cinema, and loads of places to eat. Myeongdong: full of hotels, department stores, fashion boutiques, beauty stores, ginseng stores, and souvenir tat, Myeongdong is Seoul’s tourist central, especially for visitors from Japan, China, and SE Asia. Expect to hear lots of Chinese and Japanese sales pitches from the cosmetics store staff calling to potential customers in the street. Jongno: the major east-west thoroughfare running across the main business district north of the river, Jongno is a busy shopping and socializing area. The main shopping stretch runs between Gwanghwamun and Jongno 3-ga stations, and there’s a large cluster of restaurants and bars in the network of narrow streets lying in the block to the southeast of Jonggak Station. Insadong (see below) runs north off Jongno, and the entrance to Jongmyo Shrine is on Jongno just east of Jongno 3-ga Station. 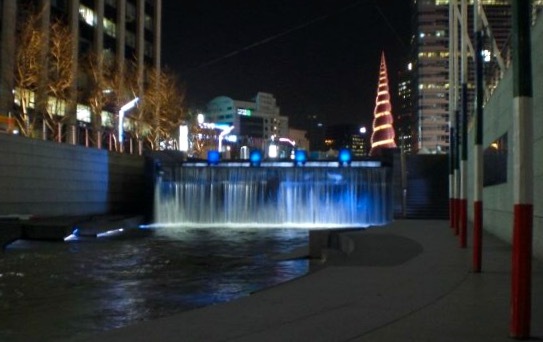 Cheonggyecheon stream runs parallel to Jongno, a short distance to the south. Insadong: a popular tourist street off Jongno (its south end is on the north side of Jongno between Jonggak and Jongno 3-ga stations; the north end is near Anguk Station), Insadong is full of shops selling souvenirs and traditional arts & crafts, and teahouses, cafes & restaurants aplenty. Gangnam: made famous by the Psy song Gangnam Style, Gangnam is the place for Seoul’s beautiful and wealthy people to flash their cash – or to spend their cash on plastic surgery if they don’t feel beautiful enough yet (hence Psy having a dig at the place). 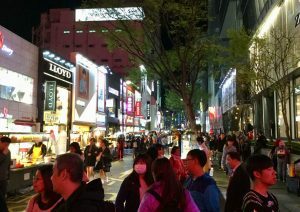 The streets in the area between Gangnam Station and Shinnonhyeon Station are full of shops, bars, and restaurants, and packed with shoppers most days. Gangnam is actually the name of an entire district, and elsewhere in the district you can find branches of all the main Korean department stores like Shinsegae and the massive Coex Mall (the world’s largest underground mall, and the location of that awesome library you’ve seen on Instagram – a good cold weather option). Itaewon: as Seoul’s main ‘foreigner district’, Itaewon is home to the city’s most diverse range of bars & restaurants, plus a handful of clubs, and sees some pretty crowded & raucous nights on weekends. It’s a mixed Korean/international crowd, English is widely spoken, and the drinking establishments in the area will be of a familiar nature to visitors from overseas, all of which means Itaewon offers the most readily accessible nightlife scene for those new to Korea. 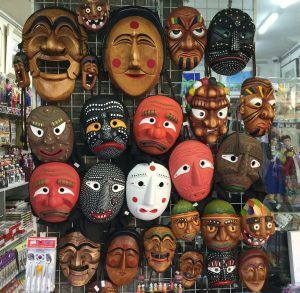 If you want to delve a little deeper, head to Hongdae or Gangnam. Hongdae: the area surrounding Hongik University (aka Hongdae) is jam packed with restaurants, bars, and clubs. Due to it being a student area it’s generally a younger, more Korean crowd than in Itaewon (though also popular with expats), tending towards the cheaper end of the scale, and with a lively street scene (live music etc) in summer though not so much in the deep cold of winter. Gangnam: Seoul’s most impressive dance clubs are all in plastic-fantastic Gangnam, and if you’re looking to go all out on a big night of clubbing you should hit the likes of Octagon. You’ll be partying with an overwhelmingly Korean, overwhelmingly beautiful and well-dressed crowd, and as long as you’re ready for the hit to your wallet Gangnam’s plenty of fun. You always need to show ID when entering clubs in Korea, and also for many bars, so make sure you carry a national ID card or driving licence (or your passport if you don’t mind the risk). Also be aware that sometimes clubs in Gangnam can be funny about letting groups of foreigners in – Club Arena has been notorious for this of late. 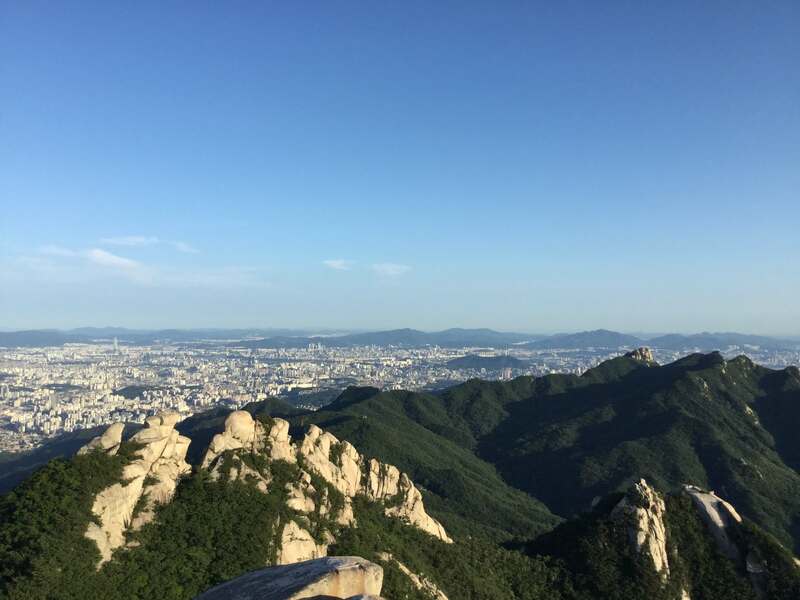 There’s plenty of great hiking in and around Seoul – see my Seoul hiking guide here. Just be aware of a few things due to the winter season – firstly of course it’s very cold, so many people won’t fancy hiking anyway. 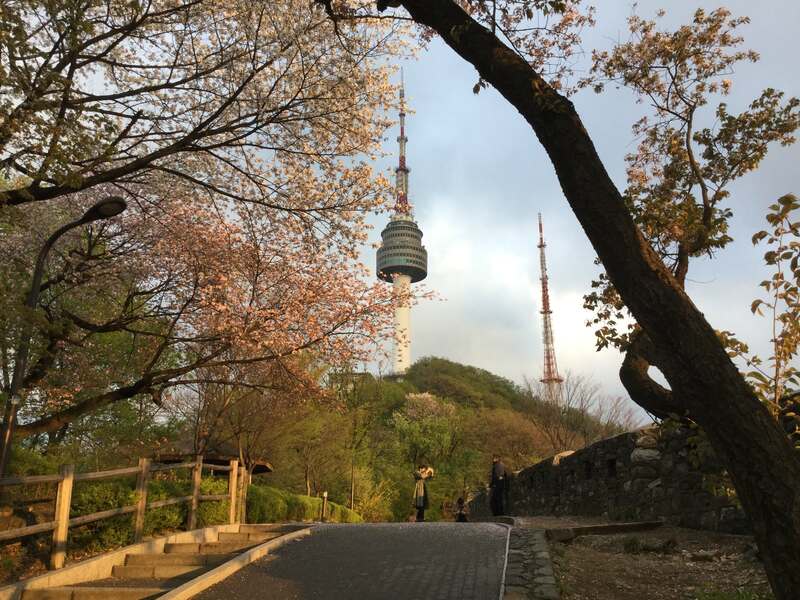 If you do, the smaller hills like Namsan, Achasan, and Inwangsan are fine in winter – Namsan in particular is nice & easy with a paved path all the way up to Seoul Tower and great city views at the top. 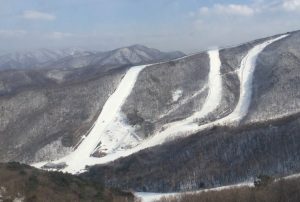 The bigger mountains like Bukhansan, Dobongsan, and Gwanaksan need to be approached with a little due care in winter. The granite formations at the tops of Dobongsan & Bukhansan are pretty treacherous in icy conditions, so you should make sure to have some spikes with you. Clip-on spikes can be bought from the shops near the Bukhansan park info centre after you get off the bus, or the stalls lining the path from Dobongsan Station to the hiking trail. Gwanaksan is fine in winter, as long as you stick to the trails from SNU or Gwacheon. The trail from Sadang Station is probably not recommended though, unless you’re equipped and capable for the scrambling terrain near the top in winter conditions. You can expect temperatures of minus 10 or below at the tops of these higher ones; obviously if it’s already minus 10 downtown, it’ll be even worse up top! The Seoul area is home to three major theme parks – Lotte World (in Jamsil), Seoulland (just outside the city proper in Gyeonggi-do Province), and Everland (on the outskirts, also in Gyeonggi-do). Everland is the largest of the three, but the least convenient. Lotte World has the distinction of being the largest indoor theme park in the world – a good selling point when it’s minus however many degrees outside! There’s also an attached outdoor area (for the larger rides) on an island in Seokcheon Lake. 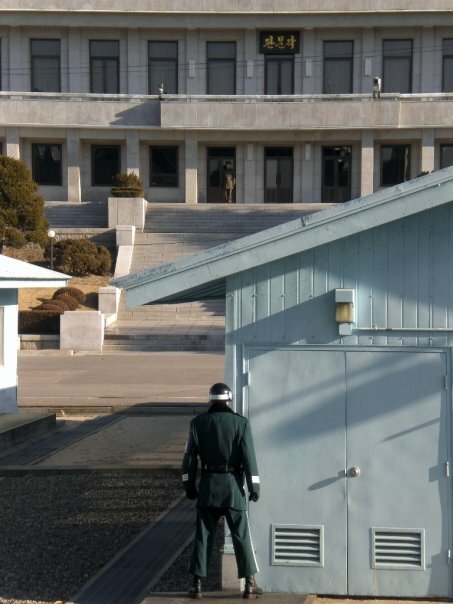 Seoulland offers a good compromise of size & convenience. Given the frigid winter weather and the travel times, Lotte World is probably the better choice for winter visitors wanting to hit a theme park while in Seoul; you can get discount tickets here. Another idea is to combine Everland with a trip to nearby Jisan Forest ski resort, see here (and see the SGK review of Jisan). There’s lots of great public space in Seoul thanks to the city’s many mountains (see hiking, above), but there are also some decent public urban spaces in downtown Seoul if you want to stretch your legs a bit but don’t fancy a mountain hike. Cheonggyecheon: this stream runs through central Seoul from near Gwanghwamun & City Hall to Dongdaemun (and beyond, eventually feeding into the Han River in eastern Seoul). It was covered over by a highway during Korea’s 20th Century economic boom, then uncovered and spruced up in 2005 as an urban revitalisation project. Walking paths run alongside the stream with various historical displays and art installations placed along them (several of which are light projections i.e. only visible at night), and in summer it’s a popular spot to paddle in the water and cool off. It’s a little less popular in winter when it’s frozen solid though! All the same, it’s still a nice place for a walk if you want to take a stroll in the city without traffic getting in the way. The section at the start near Gwanghwamun is quite concrete-lined, but the fauna increases as you walk east. 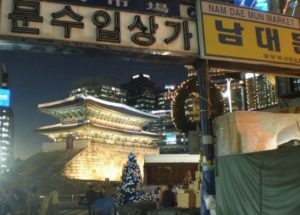 From the start to Dongdaemun is around an hour’s walk; Gwangjang Market (see markets, above) is located just north of the stream near Dongdaemun. Dongdaemun Design Plaza and History & Culture Park: the Zara Hadid-designed structure of the DDP looks like some sort of UFO parked up in the middle of the city. The architecture’s awesome and there’s plenty to check out in the area (of the fashion markets, cafes, shopping & eating variety), and you can easily hop back indoors if it’s too cold to be lingering outside. Seoullo 7017: another urban revitalisation scheme involving a decommissioned elevated road (like Cheonggyecheon), the recently completed Seoullo 7017 saw the conversion of an old viaduct crossing the tracks near Seoul Station into an elevated park and footbridge (drawing comparisons to New York’s High Line). While it’s hardly anything to get wildly excited about, it’s a good example of repurposing crumbling old infrastructure to improve an inner city urban space. Seoullo 7017 probably isn’t worth going out of your way to visit (especially in winter), but the east end of the park is near Namdaemun market so it works well to visit it in conjunction with the market. From Seoul Station (subway exit 8 is next to an escalator up to Seoullo) you can walk along the viaduct to Hyeohyeon Station, then delve into the market from there. Seokchon Lake: this artificial lake in southeast Seoul is just next to the sprawling Lotte development that seems to occupy most of the urban fabric of the Jamsil area, including the Lotte World Tower skyscraper (Korea’s tallest and the world’s 5th tallest) and the Lotte World theme park (part of which is on an island in the lake; see theme parks above). It’s especially popular in spring as one of Seoul’s best cherry blossom spots, and in autumn for the colours of the trees around the lake. 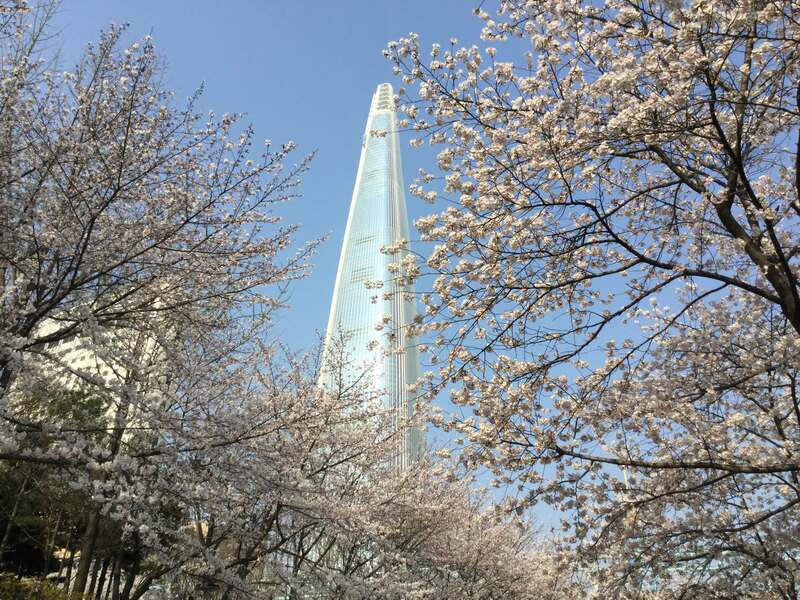 In winter it’s cold and icy, but nice for a stroll if you’re in the area to check out Lotte World Tower or visit the theme park. If you’re in Seoul during a particularly cold spell, it can fall below minus 10 in the day and minus 15 at night. If that happens and you can’t stand to be outside but also don’t want to hang around in your hotel or Airbnb, there are some decent places you can check out with direct (indoor) connections to subway stations. 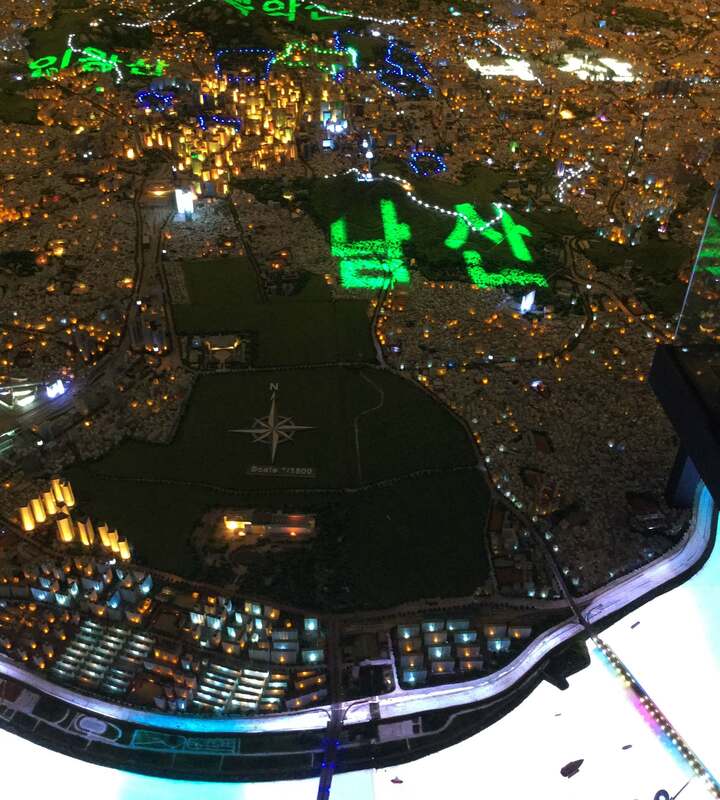 Jamsil area: as noted above the area around Jamsil Station (lines 2 & 8) seems to have been taken over by the Lotte company, with the Lotte World theme park, Lotte World department store, and Lotte World Tower all connected up underground. You can easily spend the whole day checking it all out without having to brave the cold, though the theme park’s best rides are in the outdoor section on an island in the middle of Seokchon Lake. 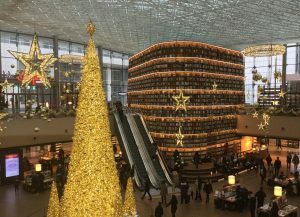 A few other department stores with direct subway access are I Park Mall (Yongsan Station, Line 1 & Gyeonggi-Jungang Line), Shinsegae (Express Bus Terminal Station, lines 3, 7 & 9), and D Cube City (Sindorim Station, lines 1 & 2). They don’t have public libraries or attached theme parks & skyscraper viewing decks, but they all have cinemas, restaurants, cafes, shops, and food courts. Remember to check Airbnb as well as the hotel listings. It’s a particularly good option in Seoul, where there’s a huge number of places available, and Airbnb’s really convenient in Korea – hosts usually have it set up so you can arrive & check in by yourself without having to wait around to meet someone for the keys, and the housing standards are decent with underfloor heating and excellent internet connections as standard. If you haven’t used Airbnb before, you can get a 35-dollar discount off your first rental by signing up through Snow Guide Korea; simply click on this link and register! Getting around Seoul is an absolute breeze thanks to one of the best subway systems anywhere on Earth. The Seoul Metro spreads across the whole Seoul-Incheon-Gyeonggi conurbation, with its furthest tendrils reaching all the way out to Gangwon-do and Chungcheongnam-do provinces; trains are (mostly) clean and punctual, service is frequent (though the frequency drops on the lines further out), and you can cross the entire city for just a few dollars. The wear & tear is showing a bit on the older lines and some lines get like sardines in rush hour, but generally things run smoothly. The best way to use the Metro is using a T-Money card; this is a rechargeable stored-value card much like those in Tokyo (Suica/Pasmo), London (Oyster Card), Hong Kong (Octopus Card), etc, which saves you the hassle of having to buy single tickets every journey (and messing about with the deposit each time – see below). 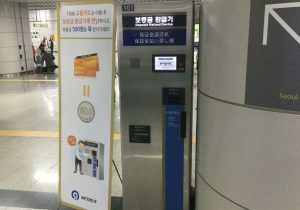 It also saves you 100 won on every fare, can be used to pay for taxis and buses, and enables you to transfer between the Metro and buses without paying twice (you just get charged for the total distance). Fares are distance-based, starting at 1250 won (1150 with T-Money) for short journeys, up to 4000 if you were to ride the Metro all the way across the system from Chuncheon to Asan (an unlikely journey however – you’d usually use the national Korail trains for such a distance). The T-Money card can also be used to pay in convenience stores and some fast food outlets, so if you’re spending any more than a day or two in Seoul it’s well worth getting one. To get yourself a T-Money card, simply visit any station and buy one from a ticket machine; they cost 2500 won, so if you’re only going to take a couple of subway rides it probably isn’t worth it, but for most visitors it’s a good idea (not least because it also saves you messing around with the single fare deposits, see next paragraph). The cards don’t expire, so as long as the T-Money system remains in place you can bring it back to use on any future visits to Seoul; and even if you never return, it’s still a decent little memento. All a bit of a faff, and another reason to use T-Money! Navigating the system is easy, with most announcements and signs in Korean and English (and also often Chinese & Japanese), and plenty of maps usually found on the platforms. You can find various apps for checking routes on the Seoul Metro; I usually use KakaoMap, which is now available in English and has a good subway map & journey planner built in. 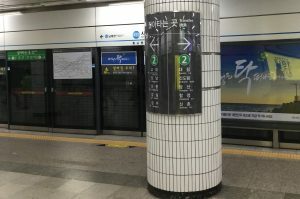 My only real gripe about the Seoul Metro is that the layout of some (ok, many) of the transfer stations requires you to go the correct way as soon as you step off the first train, or else you can find yourself on the wrong platform for the second train with no direct way across other than a tedious walk back around or asking the staff to let you through the barriers. Look out for the colour-coded signage (using the same colours for each line as on the map), and check the stations listed for each direction. Also, some of the older stations (mostly on lines 1 and 2) have no way to cross platforms once you’re through the barriers – if you accidentally go through the wrong side, or realise you’ve taken the train going in the wrong direction, you can’t simply walk over to the other side. …and hit the call button. You may have to try and explain the problem over the intercom, but usually they just buzz you through. Taxis are plentiful and relatively cheap (e.g. you can cross the city from Hongdae to Jamsil for around 20000 won), and will usually use the meter without messing about – an exception is weekend nights in Itaewon when the drivers tend to take advantage of the situation (excessive crowds, excessive drinking) to refuse undesirable journeys or to refuse to use the meter and instead ask for severely inflated fares. May be better to go eat & wait for the first subway! ATMs can be a bit of a hassle for foreign visitors to Korea. Firstly, you need to be aware that the majority of ATMs simply won’t accept overseas cards; those that do are specifically labelled as global ATMs. But even then, it isn’t guaranteed that any given bank’s global ATMs will accept your particular card – for example, I personally find that my UK Visa only works with Woori Bank’s global ATMs, my UK Mastercard only works with Sinhan Bank’s global ATMs, and my Japanese Citibank card works with most global ATMs – but not Sinhan! What this basically means is that you can’t expect to be able to just quickly pop to the ATM – be prepared for the time-consuming possibility that you may have to traipse round a bunch of banks to find one that works for you. It’s obviously best to do this in a busy area with a high density of banks, e.g. along Jongno between Jonggak Station & Jongno 3-ga Station, or around Gangnam Station. Thankfully card payments in shops & restaurants usually work without any difficulty, as long as you remember to notify your bank in advance that you’re going to Korea. If you need to change foreign cash for Korean won, head to Myeongdong. The area of pedestrian shopping streets has dozens of moneychangers; generally the further you walk down from Myeongdong Station the better the rates, with those in front of the Chinese Embassy usually being best (shopping around can get you an extra one percent or so). If you bring an unlocked phone with you, there are various SIM cards available for short-term visitors. I’ve found EG Sim to do the job nicely, which you can buy online or from the convenience stores listed here (stores away from tourist areas are often out of stock though, so go to one of the stores in Gangnam, Hongdae, Itaewon, Jongno, Myeongdong, or the Seoul Station area); they also have an app you can download to check & recharge your balance. Alternatively, you can pre-order one here to pick up on arrival. Likewise, you might want to rent a portable wifi device, see here. If you’re looking for free publicly available wifi, pretty much every bar and cafe has it, as do many restaurants (Mcdonald’s included) and some public spaces (like the COEX library pictured above). The wifi on the subway is unfortunately only accessible if you have a Korean phone contract though. Should you need to visit an internet cafe, look for a PC방 (PC room, pronounced PC bang) sign; they mostly exist for groups of gamers to play together on networked computers, but you can use them to get online if necessary. 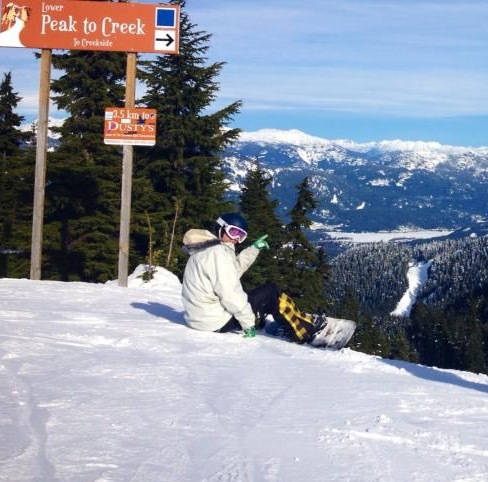 Flexible travel insurance from World Nomads; for those hitting the slopes, check out their winter sports cover. See the Korail website for train timetables. 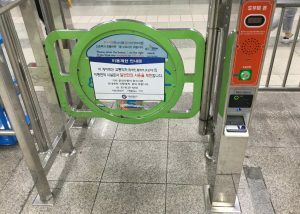 Seoul Sub→urban is a fun blog which explores Seoul one subway station at a time, visiting the surrounds of one station per post. It’s a work in progress, and they’ve covered about half of the system so far; as well as being entertaining, it’s also actually a pretty useful way of checking out an area you’re looking at on Airbnb, for example. I particularly like their take on Jamsil Station and the People’s Republic of Lotte! Any questions for your trip to Seoul? Give me a shout below! hi, im going to korea on 7th January 2019 along with my 2 kids. i will be staying in myeongdong for the whole trip. As this is our first time travelling to winter country, hence my kids would love to play with snow. Is there any cheap n nice place to play with snow there besides the Skii area? 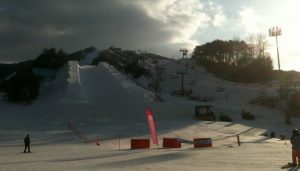 Most of the skii area has a harden snow which disable them to make a snow man. hence would appreciate your kind thought on this. Unless you have lucky timing and it actually snows in Seoul, you’ll need to go to a ski resort to see snow. As you’re staying in Myeongdong it makes most sense to go to Vivaldi Park as they have a free shuttle direct from Myeongdong. How about Nami Island and Everland? Is there any chance that they could play with the snow there? Im going to Nami Island on the second day and Everland on the third day. Finger crossing hoping that there’ll be snowfall and snow to made the snowman. That’s right, snow isn’t common in South Korea and is actually quite rare in Seoul. The ski resorts here mostly rely on man-made snow. Line 4 is one of the original lines, those older stations weren’t built with modern access standards. They’ve since upgraded them for wheelchair access, but in some cases (like Myeongdong) the lack of space meant they installed stair lifts instead of elevators. Hi Johan, there’s one single card you can use for all the public transportation, it’s called T-money and you buy it from vending machines in the stations. You can recharge it at the regular ticket machines or in convenience stores, and you can also use it to pay in convenience stores and some fast food places & supermarkets. Good cafes & restaurants are everywhere, especially Hongdae, Itaewon, Gangnam, and around the palaces. I’m not a good person to ask about instagram, but the Starfield library at Coex Mall (pictured above) is definitely all over instagram.